Billy Bishop was the top Canadian flying ace in the first World War, credited officially with a record breaking 75 victories. A highly skilled pilot and an accurate shot, he was fiercely ambitious, driven by an undisguised hatred of his enemies. He played hard and fought even harder. Unfortunately, due to sales rights restrictions, we cannot offer Billy Bishop for sale in your country. Billy Bishop was the top Canadian flying ace in the first World War, credited officially with a record breaking 75 victories. A highly skilled pilot and an accurate shot, he was fiercely ambitious, driven by an undisguised hatred of his enemies. He played hard and fought even harder. A highly skilled pilot and a crack shot, "top gun" of the Allied air forces, by 1918 Bishop was the most highly decorated war hero in Canadian history. He also remains the most controversial. Some of Bishop's fellow pilots were repelled by his grandstanding and suspected he was deliberately inflating his number of"kills." Since then, the claim has been repeated by many others. Bishop went from being the most decorated war hero in Canadian history to a crusader for peace, writing the book Winged Peace, which supported international control of global air power. While some historians feel that authorities upgraded Bishop's claims to improve morale, author Dan McCaffery presents the true life and accomplishments of Bishop through information he gathered from interviews and archival sources. 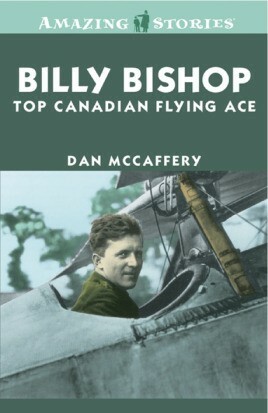 Dan McCaffery is one of Canada's most successful military aviation history writers. He is the author of Hell Island: Canadian Pilots and the 1942 Air Battle for Malta, Air Aces, and Battlefields in the Air, amongst others.